Krueger Wholesale is WUMFA 2017 Wholesaler of the Year! Krueger Wholesale is WUMFA 2017 Wholesaler of the Year! 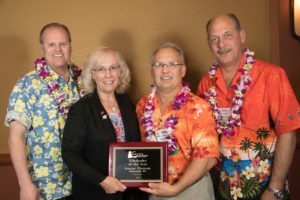 Krueger Wholesale Florist, Rothschild, Wisconsin, was chosen Wholesaler of the Year at the 2017 Wisconsin & Upper Michigan Florists Association convention. Honored for their contribution to the advancement of the Wisconsin and Upper Michigan floral industry, the company is one of the largest floral distribution firms in the Midwest. They began as a small family business in 1963 and have grown into a modern 120,000 square foot corporate headquarters and distribution center, 3.5 acres of tropical greenhouses and a logistics division. In 2013 they won the Wisconsin Grocer Vendor of the Year. They have donated flowers to the Gateway Technical College for their floral design classes and have contributed flowers for special fundraiser events. They were instrumental in making sure flowers arrived on time for this year’s WUMFA convention.